Hey ladies, here's another round up review for you. This time it is for concealers that I've been using in 2016. It is a mix of drugstore and high-end concealers for my under eye, occasional acne spots and as a highlight in some areas on my face. 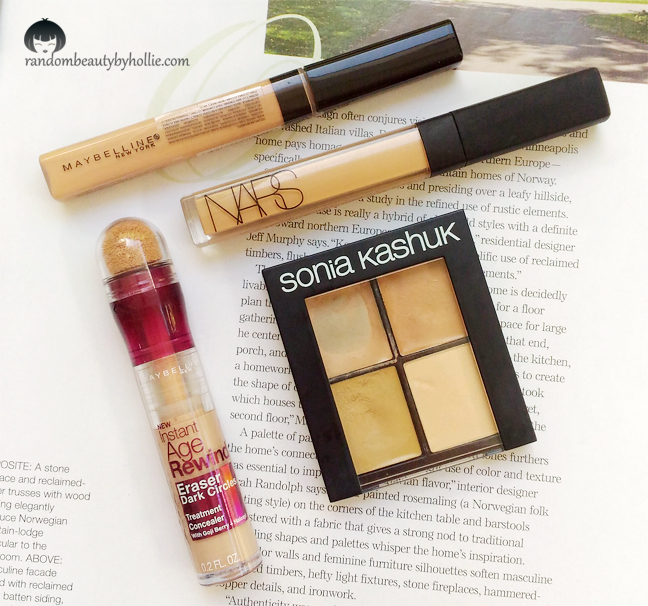 Sonia Kashuk Hidden Agenda Concealer in Light. It comes with concealers in three different shades and one powder. I normally use this concealer to hide spots on my face and to cleanup my brows. It has excellent pigmentation, lightweight, creamy, and really smooth to apply. I also love to use the powder in this palette (bottom right) to set my under eye area. It's a versatile palette but not ideal for covering dark circles. It is more effective for covering imperfections on the face. You can view my in-depth review HERE. Nars Radiant Creamy Concealer in Ginger. This is the most expensive concealer I ever bought. I keep seeing all the beauty enthusiast rave about this product on social media sites, thus I caved and got myself one. And true enough, this lived up to the hype. A little goes a long way with this product since it is the most pigmented liquid concealer I have ever used. It has a very creamy texture, applies smoothly, excellent coverage, easy to blend, does not sit on fine lines and stays all day especially if set correctly with a powder. Maybelline Fit Me Concealer in Medium. I bought this around November of 2016 because some bloggers mentioned that this was a good alternative for the Nars Radiant Creamy Concealer. When I tried this out for the first time, I noticed how easily it blended well on my skin. But it is in no way similar to the formulation of Nars. The Maybelline Fit Me Concealer has a much thinner texture and lesser coverage compared to Nars. I just liked this concealer because it blended really easily on my skin plus it is really affordable. 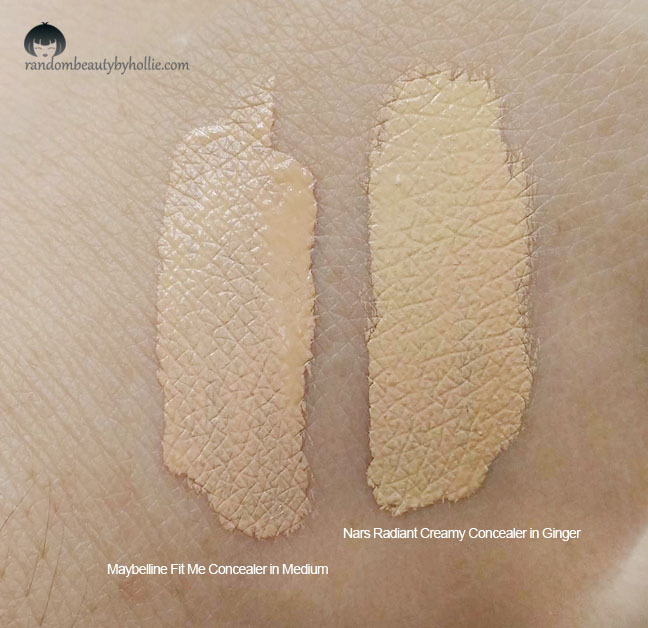 Here is a swatch between the Maybelline Fit Me Concealer in Medium VS Nars Radiant Creamy Concealer in Ginger. If you notice, the Maybelline concealer has a bit more pink undertone to it while Nars has more yellow. When blended, you will definitely notice that Nars has superior coverage, does not settle on fine lines and dries into a matte finish, while the Maybelline has a thinner texture, less coverage and dries into a semi-matte finish. Maybelline Instant Age Rewind Eraser Dark Circles in Light. This variant is not available here in the Philippines, so I asked a friend to buy it for me in the US. I picked the wrong shade. I should have gone with Neutral but I still made it work for me. Since I use it to highlight certain areas of my face. This works as a really great under eye concealer and it really does what it is supposed to do. I will be trying more concealers in the future but I will have to finish up these tubes before I buy new ones. However, I am definitely eyeing on the Tarte Double Duty Beauty Shape Tape Contour Concealer, since it has been raved by beauty gurus on Youtube. Do let me know what your favorite concealers are. I only wear foundations its very hard to find a perfect shade online without testing it on your skin. I agree with you regarding the NARS Radiant Creamy concealer, this is the only liquid concealer that I've tried that provides excellent coverage, doesn't crease and stays put all day. My second fave is the MAC Studio finish in NW25 and NW20.